I was in elementary school in the early 90’s and remember reading a series of novel/short stories in class from a book series. They were similar to Encyclopedia Brown and Nate the Great, but the time frame of the books was more low tech (they had flashlights or torches I think, but don’t remember TV ever being mentioned), probably circa 1930’s to 1950’s so a little before Encyclopedia Brown time frame. I remember 3 distinct stories that happened. The main characters were young, elementary school aged, and engaged in small town mysteries and adventures. One of the stories involved one person from this young gang following someone or something into a local cave and the main character followed them/him but tied raw liver meat to his shoes and told a friend if he didn’t come out to get a police officer and a tracking dog to find him from the scent of the liver meat on his shoes. They ended up finding him and the person lost in the cave. A second story involved a new teacher the main character didn’t like and he intended to frame him by making him appear to be an alcoholic and planting alcohol in his house. The plot may be located in a baptist southern town as the main character thought the alcohol conviction would be a death sentence for the guy. I don’t remember much of the rest of that specific plot except that Mint Schnapps were part of the story and how the teacher was purportedly covering up his alcohol breath. The teacher found him out and apologized to the kid that he did not like him being his teacher but the town had appointed him, the protagonist reconciled with him eventually. A third minor story was the protagonist forgot to study for an exam and tried to contract mumps from a friend of his who was out sick that same week. He snuck over to his friends house and asked him to breath in his face repeatedly. The protagonist was young, coming of age, used m’am and pal a lot in his vocabulary. The book or series may have been published in the 70’s or 80’s but I don’t remember a whole lot of technology being used in the stories though, and the prohibition aspect lead me to believe it is older. It could be Encyclopedia Brown but I’ve read through what I believe to be all of the book plots and didn’t see it. I read this book in the late 70’s or early 80s. It popped into my head today; I don’t know why, and now I feel driven to reread it, but again, I don’t know why. The cover was an outdoor scene — a grassy field with some blurred figures, hard to make out. The novel was about a girl who lived in a hospital or an institution. She was physically disabled (wheelchair) and also did not talk. However, she did laugh at least once, and it seemed that she may have had a sense of irony that others didn’t recognize. The point of view was, I think, from her brother, who was visiting her. There was something disturbing about the story, but I can’t remember what it was. The only other thing I remember is that she had a unique name. This may also have been the name of the book. It had a T and an I in it – Tig? Twig? Twich? THANK YOU! I’m looking for a book that was given to my mother and that I also loved as a child. Mom was born in 1928, so I think the book was from the early 30’s. I think the title was just Nancy. It may have had a subtitle–I can’t remember. It was hard-covered with blue patterned paper; I remember it as being square, or nearly so, roughly 10 x 10. Each page had a black and white photo of a girl of about five engaging in various everyday activities. The one I remember best showed her with a sudsy rag washing the big glass window in the front door of her house. I have fuzzier memories of photos showing her riding a trike and eating from a dish. She reminded me of Shirley Temple–similar clothes and hairstyle. There was a small amount of text with each photo. My sister and I would love to have this book again! I read it in the 1970s. It was written for girls, maybe came in two volumes, the copies at the library had stripes on the covers. Came from the Beverly Hills Public Library, if that is helpful. I think it took place in a girls’ boarding school. Maybe there was one girl called Cordelia, shortened to Cordy. Maybe in it they told a story about a Castle Drachenfels. It’s possible I’m mixing this up with another book, but maybe not. I was born in 1977, and remember a picture book with lots of detailed illustrations including cross sections of spaceships and people on conveyor belts being fed via mechanical arms from ceiling (I remember a woman tilting her head back to receive a giant claw full of salad). Also, a kind of altered lawn tractor that did everything, including cutting all the flowers off with a reciprocating hedge trimmer attachment. I thought I may be confusing this with “Little Monster Goes to Work”, which i also loved, but having recently looked through the latter, realized it is a different book. Please help! I read a book in the 5th grade so around 1972 (I think) about a girl named Queenie. I think she was a young teenager and she was poor and lived somewhere with a lot of dirt roads. I think it was during the Great Depression. She ate "poke sandwiches" or "poke biscuits" where she would poke her thumb into a biscuit and put jelly or honey and eat it after school. That's all I remember except that the book has stayed with me so I would like to read it again. I’m looking for information on how to obtain a religious booklet from my childhood. Title: The Way of the Cross for Young Christians. Probably published in 1970. It has retro artwork, and I was able to find a picture of the cover. 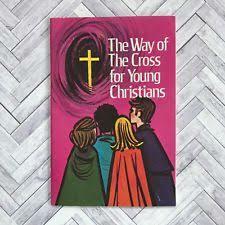 The images from this book are seared into my brain and were a huge part of my Catholic school childhood. Also, I think the illustrator, Jeanne Hunt Miller, might have done handkerchiefs in a similar mid-century modern style, many of which are available on Etsy. Don’t know if that helps? One last thing, the author may be Rev. William J. McLoughlin. There’s an updated version on Amazon, but it has different illustrations; I also called the publishing house, but they only had the new publication with the blue and yellow cover. I’m looking for a children’s picture book from the 70s or 80s for my friend. Her mom used to read it to her, but she can’t remember the name. It’s about a boy who floats down a river and has many adventures on the way involving animals and food. She thought it was “In the Peanut Butter Colony” by Louis Ross but that doesn’t look right after all. Thank you for any help!